Guess who made the list for 2016? To make the CIO Applications list, a company has to help its clients “build competitive advantage and transform their businesses.” RASTRAC helps companies that rely on vehicle fleets do this through the use of GPS fleet management solutions. As we’ve said before, GPS tracking is much more than just “dots on a map.” The right GPS solution can help give businesses an edge by making their vehicle fleets faster and more efficient. RASTRAC’s mission is to provide automated tools that are flexible yet easy to use. We provide one “shop window” that gives automated vehicle tracking to fleet managers using a powerful combination of GPS and wireless mobile data communications. Using a combination of tools such as location tracking, geofencing, remote vehicle diagnostics, and driving habit assessments, our clients can create controls for their vehicle fleets that are as comprehensive as necessary, while still being easy to manage. Controls for vehicles can be further enhanced using RASTRAC’s optional Map Marker Plug-in, which allows for real-time viewing of fleet vehicle routes, including time since a route was last serviced. Municipalities often use this feature for tasks such as managing snowplow operations or managing police patrol routes. Having a mission to help clients gain competitive advantage is nice, but to make the list, you have to deliver results. RASTRAC has repeatedly helped companies in the USA and beyond improve their vehicle fleet operations. For example, construction contractors in the USA have used RASTRAC’s devices to monitor heavy equipment. These companies were able to use the data collected by RASTRAC’s tracking devices to monitor engine use and synchronize engine hour value on each piece of equipment they fielded. RASTRAC’s other clients include companies that operate in Latin America, the Middle East, Europe, Asia, and Africa. These companies use RASTRAC’s GPS tracking solutions to monitor and improve vehicle fleet operations and maintenance, driving results while reducing costs. 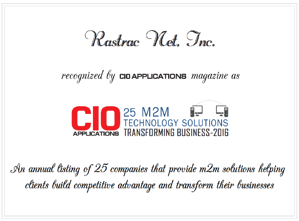 Everyone here at RASTRAC is proud to have earned a spot on the CIO Applications list, but we all know that we can’t rest on our laurels. The RASTRAC team is dedicated to continuing to provide industry-leading GPS tracking and equipment monitoring solutions to meet a variety of business demands. We will keep working to make our hardware, software, and our people the best in the industry, and to drive results for all of the fleet managers we work with.